No, not a tribute to my blog. It hasn't been good enough to deserve such a thing. Ten posts in the last year? Wowsers. Not that I'm planning on improving or anything - I just needed somewhere to right down my memories and thoughts on my Uncle Bert. In other words, my tribute. At this point in time, my uncle - great uncle to be exact - is not doing well at all. He became unresponsive three days ago, and though he has woken up a few times, he has generally been in this state. Just a week ago, he was up and about, writing, discipling, and encouraging others. Yet this turn for the worse has not really been a surprise. Doctors told him he wouldn't make it 'till Thanksgiving - a year ago. He has lived much, much longer than anyone ever gave him, and he has taken many dips up and down since then. Somehow, however, he always seemed to get back up on his feet and keep going, keep witnessing, keep loving and serving his Lord. Though I would never go as far as to say that his faith kept him alive longer than anyone anticipated, his positive attitude, even in the worst of all his ailments, made every one of his words echo with love for his Saviour. Not that he was literally saying "Jesus, Jesus, Jesus" 24/7. Yet, as I think about it, in a way he really was. The reason he was so optimistic about life was because he had faith. He knew that God's plan for him was a perfect plan. He therefore spoke every word in that light. The product? A whole conversation that may not even have the word "Jesus" in it, yet everyone who hears knows that Bert loves God. I think that is truly what being the fragrance of Christ means. It doesn't mean saying and thinking "Jesus" non-stop until death. It means living life, speaking conversations, and even sleeping sleep with the "glasses" of knowing that you are a new creation. A creation that has all its hope in God. Yes, that great uncle. The mysterious one who lives in a grass hut in a tribe out in the wilderness of Africa. It seemed so distant. So surreal. Yet even now as I walk t hrough he and his wife's house, I see evidence that such things were true. A plethora of animal carvings make it unnecessary to bother going to a safari. Traditional carvings in black wood of Afrikaners almost look grotesque hanging on walls and sitting on book shelves. Verdant hills demand the viewer's attention in pictures of Africa. His Africa. 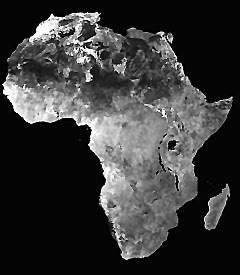 The Africa he spent fifty years in, telling others of Christ's love and atoning work. He was the mysterious uncle that was coming to visit us. Somehow to an eight-year-old (approx.) like me, when I heard he was from Africa, I expected him to...you know...look how he was supposed to. Plates in his lips, piercings, skulls around his neck, etc. (note: no offence to anyone of African descent. This is just what I thought Africans who lived in tribes were supposed to look when I was eight.) When he got out of the car, much to my surprise and disappointment, he was normal. Just another of those boring grown-ups who do boring things and talk about boring stuff. That was the last time I can ever remember being disappointed with him. He sure didn't quite look like he was supposed to, but every other African legend I had heard suddenly came to life when he was around. Because of British influence in Africa, he had picked up many (odd to an American eight-year-old, I might add) habits. Becky and I would sit, almost in a trance, as we stared at him dunk his graham crackers into his tea. He would tell us stories of that far-off continent, lulling us into an ethereal state of dreaming about grass huts, voodoo, and snakes. Suddenly, without warning, he would start singing hymns, "John Jacob Jingleheimer Schmidt," or "There's a Hole in the Bottom of the Sea." I think the "There's a hole in the Bottom of the Sea" needs a hole drilled in it for some of the substance to be drained out, for I remember Uncle Bert once taking Becky and me on a walk and singing that song at the top of our lungs - for the whole walk. And no, it wasn't a particularly short walk. My uncle was also very intent on getting us to learn Swahili, so everyday, out would come the sheet of paper with some new words to add to our growing vocabulary of necessary words to get by in Africa: tea, dog, spoon, thank you. And then would come the stories. I remember him once telling of how they had put their son down to bed for a nap in the afternoon. His wife went to go check on him, and low and behold, a very large snake (6-8 ft.?) was comfortably taking his nap on the floor beside the crib. Another time (which actually happened much more recently), Uncle Bert's wife brought some laundry to the laundromat. When she arrived, she found natives doing voodoo around the laundromat. Apparently, something had gone askew for the natives the day before, and after blaming it on the laundromat, then proceeded to put a curse on this building. Such were the stories he told, and sad was the day he left our house to return to that strange, distant place. Several years later, Uncle Bert was forced to move back to the US because of his declining health. He eventually settled down in Denver with his wife. That was probably 3-4 years ago (?). Back then, the doctors didn't give him much longer to live. Ever since then, he has been up and down. He has such a will to live and to keep going for God's glory, but in a way, I can imagine that it would be very hard to die over the period of several years. Yet, leave it to Uncle Bert, he has never seemed unprepared to die. In fact, every time I saw him, I (sadly) was a little surprised that he seemed to be ready to be whisked off the face of this planet at any second. He had peace and was perfectly content to be here on this earth how ever long God wanted him to be here. He has never seemed to lack faith. He just keeps going on and on. Never has he "officially" retired. In fact, when I was at his house a few days ago, I saw papers he had been writing and books he had been studying. He's never stopped. All the in-home hospice care-givers know him and are in awe of him. But really, how does he do it? How can he seem to always be living for Christ? Even as I was in his room a few days ago, he wasn't completely responsive, and in no way was he trying to recite verses. Yet, there just seemed to be this presence of peace and of joy. Despite the fact he most definitely wasn't sitting there trying to check off points of the Decalogue he had kept, he naturally was loving, caring, and obviously loved God. The reason he could do this was because he had his eyes on Christ and Christ only. We all get way too caught up in trying to keep little nit-picky things in the Commandments, and yet, if we are living in faith, these things happen naturally and without us looking like we're trying to keep every. letter. of. the. law. I love the illustration of how if we are in a boat, we're heading to a goal (Christ) and what comes off the back of the boat (the wake which represents our works) is just the natural product of keeping our eyes and goal centered on Christ. If we start focusing more on the wake, the only thing the world will see is our hard work at keeping the Decalogue. In other words we aren't in the boat to try to produce the wake. The wake comes naturally. If we start focusing more on the wake, the world won't see even a glimmer of Christ in us. You know how you'll be going along living your ordinary little life and all of a sudden *BAMM!! * something will happen to make you re-think everything? That's how Uncle Bert has been for me. Every time I see him, I am reminded of how it is impossible to look on Christ and our works at the same time (another great quote I like to pretend is my own :D). His living in faith has given him that peace, rest, and joy that comes only from truly knowing and having a relationship with our God. Even in this whole slow dying process, he has seemed perfectly ready to die at any time. In fact, I don't think I've ever known anyone so ready and willing to die as soon as his Lord calls him. He's really made me even consider whether or not I could happily and readily die...right now. Just a couple months ago when I was working in the ER, a 16-year-old guy was killed in an accident. As I watched him breath his last, I almost started feeling frantic, wanting to know that he knew Christ and that he wasn't dying in unbelief. But there wasn't anything I could do as I watched his life slip away. Combining that experience with thinking about Uncle Bert and his life has really made me re-think what in the world I think I'm doing here and why so often I take this precious thing called grace for granted. I have to say that as I typed out this post, "Day by Day" kept coming to mind as a hymn that definitely describes my uncle. Bwana Asifiwe, or Praise the Lord! No, I haven't died. I haven't even vanished. In fact, I haven't been doing much of anything except ignoring that (despicable) thing called networking. And yes, I do plan to ignore it for quite some time yet. I just figured I'd better post something before my name gets erased from the universe as one of those who has a DEAD BLOG. *gasp* No, my blog is not dead - just dormant. Okay, it's not that interesting, but maybe it's more interesting than my last post. I discovered the other day that if you go to Michael's (or probably any other craft store), you can find really cheap gerbil stuff. Okay, $3.99 isn't that cheap for a hunk of wood, but it's a steal for something for your pet. I've been noticing that if if something has the word pet on it, people seem to think they can charge crazy amounts. 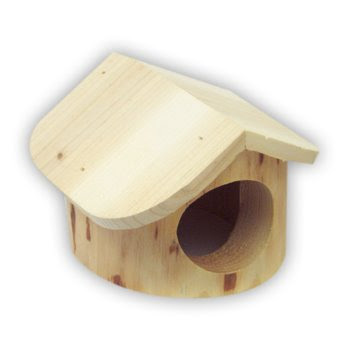 For example, this house from Petco: normally costs $7.99. No kidding. And no. I haven't wasted my money on it. I just noticed it. It's crazy. It's literally a drilled out log with a roof glued on top (and I bet the glue isn't gerbil-safe!!). What makes people think they can make something like that cost so much? 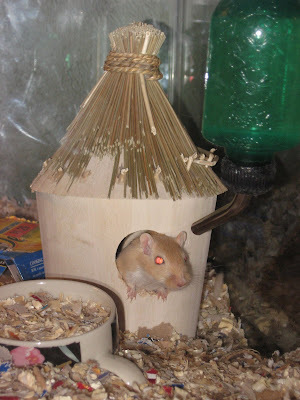 Believe it or not, the one above actually used to have the hay stuff hanging down about an inch-and-a-half, but the evil gerbil with red eyes chewed it all off. Both of these were actually made for birds, so the holes were pretty small. 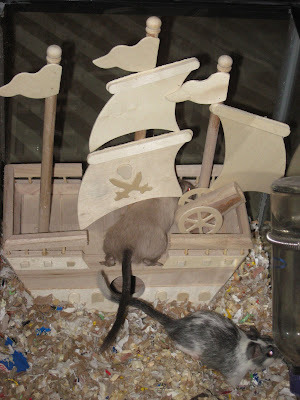 Of course with gerbils, this is never a problem because they just chew the hole bigger anyway. I also had to sand a couple places just so the AGS (American Gerbil Society - and yes, there is such a thing) wouldn't come and lock me up. Well, that's my attempt at making a more interesting post. You either get really boring stuff or you get gerbils. Which would you prefer? Oh, neither? Sorry, I didn't have that as an option. I was reading through a couple posts ago and realized what a crumby job I did explaining things, so I thought we'd try this again. I realized how often I throw out the phrase "read the Bible as a whole" but fail to really explain what I mean by that. Everyone will agree that you should read the Bible as a whole - after all, it is one book, but I think a lot of people don't understand what that truly means. Assuming you read (and if you didn't, don't feel like you have to :-P) part one of this topic, I'm going to hopefully assume that you understand that I believe that everything in the OT points to the Christ event and does not manifest itself in the modern-day Christian. "Now, with that in mind, do you believe that verses can't be quoted, or sections of scripture memorized or meditated upon, for fear of taking them out of context?" No, I don't believe that. I believe that we should memorize, have quiet meditation, and read selections of the Bible; however, there is a danger in doing that that we must be aware of. 1) If we cut a portion out of the Bible and don't have anything surrounding it, we're going to miss-interpret it. Prophesies that were being foretold about Israel will suddenly seem as if they're being told about us, and laws that applied to the Israel before the Christ Event will seem as if they're applying to us. 2) We tend to want to apply everything to ourselves and will apply those things if not understood in their proper context (not to say we shouldn't be doing a lot of the things in the Bible -but hey! that's living the law of love). However, we do have to remember that Christ fulfilled all the Torah and the whole OT for that matter. 3) People will get what they want out of the Bible. We've all seen how two people can interpret a passage two completely different ways. It's only natural because (unfortunately) we all come to the Bible with a mind that already has decided what it's going to find in it. This can lead to major problems, particularly in "proof-text battles" where two people are finding verses to fight each other with. Because of this, many people think that the Bible contradicts itself over and over. Not so. It has to be read and understood in relationship to how and when it takes place in the unfolding of the renewal of all things. 4) Christianity will (yet again!) look like lists of do's and don'ts. Many times when Christians are feeling down, they'll find a random verse that really helps them pull through. I'm totally all for that person being able to find comfort in a verse, but many times if the person had understood the Bible correctly in the first place, they wouldn't need to find a verse to help them at all. Just seeing God's faithfulness throughout everything and living in faith would be enough to help that person through. Don't think I'm being cruel in saying that a hurt person can't find comfort in the Bible. What I'm saying is that a Christian's ups and downs are all because the Christian doubted God. Whatever made that person think that God was not with them? Was it because they didn't have enough time to do their devotions that morning? If so, not true. Since when does God's grace depend on something we do? Having said all of that, yes, I do believe that a Christian should meditate on passages and memorize. However, the Christian should be very careful not to fall into one of those traps. "Another question that would pop out of this conversation, in the realm of Biblical theology, does the bible need to be re-organized to be chronologically accurate?" No, but everything in the Bible must be understood in relationship to whether it came before or after the Christ event. If it came before, we should see how that thing points to Christ and how Christ fulfilled it, and if it comes after, we should see how it shows the outworking of the restoration. "You made the point that since our human minds are corrupt and fallible, that our human reasoning is susceptible to make the wrong assumptions about scripture. I agree, however, aren't you depending on the mind to correctly assess "how the Bible fits together " even while using the system of Biblical theology?" In some ways yes, and in some ways no. It is true that we must use our minds to understand things and that yes indeed, we are fallen and will therefore have holes in our thinking. However, I think letting the Bible interpret itself in the order of how it presents itself is much more fool-proof than taking it and applying it to ourselves. At some point, we are going to have to believe something. We can't just go around thinking nothing is the truth. We do know for sure that the Bible is the truth, and we have a lot better chance of interpreting it correctly if we let it interpret itself by leaving behind our preconceived notions (which is impossible to do :S). It's so, so hard to go to the Bible and try to understand what it means without all your years of getting something else ingrained into you interpreting it for you. But that's where we must have faith that God, through his mercy, is allowing us to grow and mature and to learn about him by his Spirit. I was going to put all of this as a comment, but I realized how long it was, so I get a free post out of it! Thanks for the discussion, guys. Just recently ran across these - they're pretty hilarious! Your mom wished you'd stop reading and do something else for a change. Your stacks of books to check out was taller than the librarian. Your school bus was a 9, 12, or 15 passenger van. You looked forward to turning 18 so you could finally vote. Your father has told the check-out lady at Wal-mart, "We're on a field trip." You had to decide what year you want to graduate. You got to school and the teacher asks you if you've done all your chores. You had to move dirty laundry off your desk before your can start school. The signatures on your diploma all end with the same last name. You enjoyed the pastime of watching public school kids walk home from school. You had to look at the clock to see if you can call your public school friends yet. You think that public-school-kid is an insult of the highest degree. Your friends talk about waiting in line for seven hours to try out the new roller coaster in town, so you went and waited five minutes on a school day. Your friends complained about a hard day at school, and you have to keep yourself from giving them "that homeschooling smile." You hear the phrase "socialization" and laugh because you have more friends and know more people than your public school friends. You have more siblings than sweaters You know what a 'Park Day' is You read for fun. You have suffered through Saxon Math. You regularly utilize words such as: "malingering", "tedious", and "indubitably"
When asked about your GPA, you say: "Oh, probably 4.0." You have no idea as to what rock bands are currently popular...but you can recite all of the stages of cellular mitosis (in order). Your bedroom was your classroom and your bed or floor is the desk. You could get days ahead in almost any subject. You recorded, planned and graded your own school work. You forgot about the minor holidays until you see your dad sitting home in sweats or your public school friends ask you over the weekend what you did on your day off. You didn't know what's spring break is. Your mom counted watching a war movie as history and playing out in the snow as PE. You had more friends way older and younger than you than ones your actual age. You can use the Mrs. Vick tone of voice. You’re never really sure when it's ‘lunch time’, and you eat at different times everyday- depending on when the baby naps, and how long History took. People shake their heads and sigh, because of your lack of ‘freedom’, and you smile because you know they just don’t get it. Nobody knows who you are, and no one can remember your name. Someone asks what grade you’re in and you’re not sure. You are unaware of the current fads, fashions, and slang terms. You can quote lines from Shakespeare, but not from South Park. You have meal worms growing in a container...on purpose. "Bruno smiled, brought out a wallet, handed some notes to Roebuck, who thanked him and left." From this sentence, we should be able to draw several conclusions that will in turn show us how to live. Smiling is something people will do before giving you money. If you want money, get people to smile. Wallets are something that must be brought out in order to have the mullah flowing to your hands. Therefore, if you want the money without the smile, you will have to use your powers to somehow bypass the step about getting the person to smile. If you are trying to get a friend, fiend, or homeless person to go away, give them money. They will thank you profusely (or not...) and will leave. We now know how to get money and how to get people to go away. But wait! If getting someone to smile is one of the steps to "legally" getting money, how are we going to do that? We must find another sentence of the book to show us this important step. "Bruno smiled inwardly as he heard of his own funeral being planned." We all know that smiling inwardly will lead to an actual physical smile, so we're well on the way. People find it rather funny to hear of their own surprise birthday parties being planned, or, in this case, one's own funeral. You must do something funny for them. Let the person "accidentally" find out about something special for them. This will cause the person to grin. The bigger the grin, the more money is forth-coming. Congratulations! You now know how to get money! Okay, feeling pretty confused? You shouldn't be. All I did was to take two sentences and tell you what to do because of those two sentences. I can tell you're still not convinced. Come on! I gave you a whole new practical skill, and it was so extremely easy! All I did was take two random sentences and draw conclusions from those. Simple. However, I'm often surprised at how many people do this exact same thing to the Bible without blinking an eye (it's scary, but I'm in such a habit that I still do it sometimes). Is it just because it's a "Holy book" that people somehow feel like they can start reading parts without any relationship to the rest of the book? Believe it or not, the Bible is a real...live...book. Yes, a book. It is, of course, a very special book, and I would never deny its authority. However, I'm going to go as far as saying that this Book can (and should!) be read like any other book. In saying this, I mean that it should be read in order - not pulling random verses out for scrutiny without knowing any of its context. Just like those two sentences from Circus don't make a whole lot of sense without knowing where they fit into the story, individual verses out of context aren't going to make sense without knowing the historical context. The Bible has a plot. Not hundreds of little plots. One complex yet surprisingly simple plot. That plot is the most important and life-changing plot that a book could ever have, and yet, so many people overlook it. Instead, they see hundreds of little plots all showing us how to be better and wiser people. All these plots are actually facets of the Big Plot. What is this plot? It starts right back in Genesis when man died (spiritually), and the perfect, shalomic world was marred with the ugly reality of man trying to do instead of be. And yet God, out of His mercy, promised to bring life out of this seemingly indestructible death. This sets the action rolling, and the whole Old Testament is leading to the Christ Event. Each individual story in the OT is actually showing God's faithfulness despite man's faithlessness. It continually shows God keeping His promise of bringing life out of the woman who had brought death. And then the most glorious and profound thing happens. Christ does come (what do you know? ), and with His coming, His life, and His death, sin, darkness, and death are conquered. Life has come out of death. The NT is the outworking of the Gospel, and it shows how all the "laws, prophets, and writings" were fulfilled in Christ. What an amazing plot! So simple yet so profound that most people don't even realize it's there. Though I am *very* thankful to live in a Christian family and to be brought up as a Christian, I find it almost a little enviable to think that those who have never read or heard the Bible don't have all their preconceived notions about what the Bible is. Those of us who have been brought up as Christians have the distinct privilege of having some of our earliest memories as being told Bible stories. And yet, sometimes I think that's almost a curse. When we've been brought up like that, we have it ingrained into us that the Bible is just full of short little stories to tell us how to live. Though this isn't completely wrong, it falls very short of what is actually contained in the Bible. If a Christian ever figures out that the Bible is just one story, it takes many years of rewiring before he can finally get to a passage in the OT without immediately trying to apply it to himself as a moral lesson. Yes, I am a little jealous of those who didn't have the privilege of growing up in a Christian home. As I reached the one-year mark of my blog being in existence, I looked back on all the posts I have written. Many posts are just "blog material" (this is what I've been doing, etc. ), but many of my posts are also a testimony of God's work in my life. When I post these "testimonies," usually it's just a conglomeration of what I've been thinking about for the last several days. I will have an issue that was brought up to me, either by someone else or just something I happened to be thinking about. After thinking about the certain issue for several days, that's when I finally sit down to right what I've decided regarding the issue. Of course, what I've decided isn't necessarily right, and I would be the first to admit it - I have many, many holes in my understanding. 1) I don't want to break up the body of Christ. Wow there. That's a little scary to think that man's fallen nature could break up or even separate the body of Christ. Does it seem possible that with all Jesus has accomplished in restoring us back to God that something we do could separate Christians from each other? No - I think that seems a very weak argument. Sure there are differences in what people may believe about certain issues and doctrines, but just because they happen to believe the opposite of another believer doesn't somehow mean one of the two people are not saved. There is nothing that anyone could ever do that would break up the body of Christ. We are the body of Christ - the living stones being built up together to be Christ's church. If you think that we could somehow break up the body of Christ, this is because you don't know what the body of Christ is. The body of Christ is about being united in Christ - not in externals such as having similar backgrounds, being of the same nationality, having similar interests, or even agreeing on a given set of doctrines. The body of Christ is united only in Christ. Nothing else. Of course there could be other similarities between brothers and sisters in Christ, but if there is not, it does not necessarily mean that someone has gone off the deep end. 2) I don't want to cause our differences to affect our friendship. Though this seems very legitimate, I think that issues can be discussed and come to a conclusion in love. Remember the law of love? It comes in here too. I would be the very first to admit that in the past, in my zeal to get people to understand the Gospel, I have not spoken in love. "Being preachy" is what they call it, and it does not come from a heart of love for others. Yes, issues can be discussed, and I do believe they should be. Your friendship should not be effected if you are speaking in love and remember that your common bond is in Christ - not in a given set of doctrines. 3) I don't want to discuss things because I don't want to look stupid. This is one of the lousiest excuses I've ever come across. How else can you know how to defend yourself unless you have the experience of actually having to do it? Coming back to what I stated earlier, one of the most beneficial things for me is to be forced to say what I believe about something and why. That's why my blog has also been good for me. It forces me to have to put what I believe into words instead of "ummm," "uhhh," and "let's move to a different topic." I believe that the Spirit works differently in Christians to force them to think. If you are never confronted with something you don't believe, you will never learn to defend yourself, think through what you believe, and convincingly know why you believe it. People pointing out errors in what you believe is actually one of the most beneficial things you will ever go through; it points out where the holes in your thinking may be. I see such a huge problem with Christians who will refuse to discuss issues with Christians they know don't believe the exact same thing. It is so good for Christians and will help them grow tremendously in their faith to have to think through and discuss what they believe. The body causes the growth of the body, and this growth is helped most by talking with, discussing, and encouraging Christians. I'm not at all saying that growing can't be done through agreeing on an issue. I'm not saying that at all, but I do believe that variety in the Body of Christ causes Christians to grow. Having said all of that, you're probably wondering where in the world I'm going with all of this. Actually, I do have a plan. I have gotten this very distinct feeling that people will only comment on my posts if they happen to agree with everything I say. This actually kind of makes me sad/mad that people will not challenge me in what I believe. Does this mean that they aren't thinking, or am I so unapproachable that they can't even disagree with what I say? Of course, I don't really see a problem with people agreeing with me either. =) I also get this feeling that if people so dare to disagree with me, they wouldn't dare comment with what they think is the hole in what I believe. They'll just keep quiet. However, I would like to suggest the opposite. Please disagree, but please also tell me what is wrong with what I am saying and why. I need you guys! You will actually be doing everyone a favor to discuss these things because it will help you to grow in the faith. The family of Christ is there to help each other to grow - not to just dismiss what they are saying as being wrong. I know I have numerous faults in what I say, and you will be doing me a great service to show them to me. Of course, this all has to be done in the law of love, realizing that any differences in opinion we have are not the big picture. The big picture is that we are restored back to God and that our great commonality is in Christ. Thank you, everyone, for reading my blog. I do appreciate the time that people put into reading and commenting on it. Please don't get me wrong and think that I'm forcing people the discuss things. This is not natural, and I don't believe it's right, but if you feel so inclined, I would really appreciate discussion. A blog for doing two of my favorite things: lecturing and debating. Feel free to disagree with anything I say, and express your opinion by commenting. This blog is open for discussion.